Antivirus programs will prevent virus or malware infection, and firewall software will block unauthorized access to the network and the computer, but what about protection for private information on your computer at home or at work? Data security breaches happened due to lack of protection. Fortunately, there is a program called Identity Finder that can help prevent identity theft on the computer. There are several identity types to protect, such as credit card numbers, social security numbers, passwords, bank account numbers, dates of birth, mother's maiden names, personal addresses, passport numbers and many more. The private information is not secure if you don't protect it from being accessed or viewed. In this article, you'll learn more about Identity Finder and how it works. Identity Finder runs on Windows 2000 Pro with SP3, XP with SP1 or higher, Vista, Windows 7, Windows Server 2003 and 2008. Macintosh users can also run this program. Setting up Identity Finder does not require advanced knowledge. It's easy to install and there's an option to customize the installation by installing only the Windows add-on that you prefer, e.g. integration to context menu and explorer, file association (.idf) and adding a desktop shortcut. The program will only use 28.3 MB of hard-disk space. 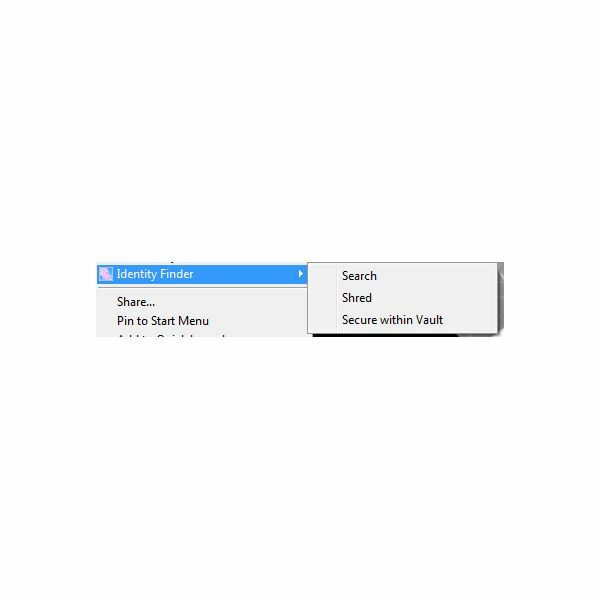 If you opted to install using typical installation, you should see the useful context menu of Identity Finder that allows your private information to be searched, shred or secured within a vault. Search for sensitive data on your computer. If you are a system administrator, you can use Identity Finder's console module to remotely manage client computers. Secure found sensitive information by sending to password vault component in Identity Finder program or secure with profile or alternative password. Add to "Ignore List" – This option allows you to ignore sensitive data found on your computer so the program will not display it again. Search not only documents but also browsers data, email, files and compressed files, Windows registry or entire computer and external drives. I really like the option to secure found personal information with another password. This is not encrypting files but encrypting sensitive and private information such as passwords, credit card numbers and other data that you want to keep on your PC. Shredder for browser data that cannot be secured. 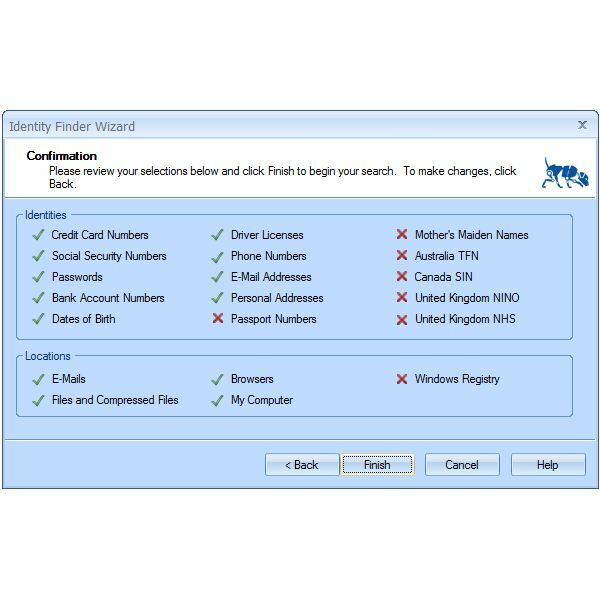 Users of the free edition can always activate the program when launching Identity Finder. The program requires a profile password so no other user can access saved sensitive data within Identity Finder. Note that to flatten the information on the above screenshot for privacy and security purpose. The result presented by Identity Finder does not only say there's a password and username found on this website and other documents but it highlighted the text what is my passwords. Imagine having compromised computers running Windows and Mac operating systems where another person can remotely access, view or find such information without your knowledge? Found sensitive data can be secured using Identity Finder e.g. shred, send to password vault and secure with profile password or alternate password. The memory usage of Identity Finder is not much. It will use 16 to 30 MB while idle or when running a search. You can schedule it to search for sensitive data which means you'll never miss when sensitive information is stored again or waiting to be secured. The price is right because there are several flavors: Identity Finder free for personal use, Home and Professional editions only cost $19.95 and $24.95 for single computers with 1 year of subscription, respectively. Enterprise edition is also available which you can buy also via Identity Finder online store. Image credit: Screenshots taken by the author, courtesy of identityfinder.com. Information based on author's experience.